Beautiful comforter set, looks great in my bedroom. Now I just need to paint the walls. 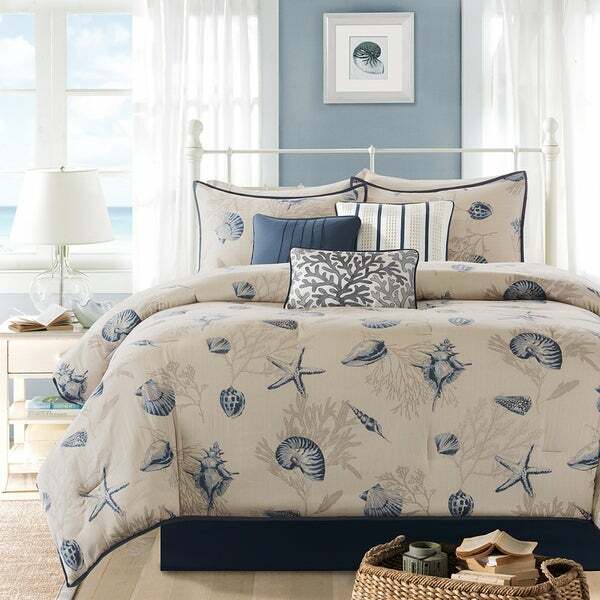 Create a coastal getaway right in your bedroom with the Bayside Comforter Collection. Made from 200 thread count cotton sateen, the comforter and shams feature assorted seashells accentuated with light and dark blue coloring on an ivory baackground. In a deep taupe color, a coral motif is printed on the background to give another dimension to this pattern. The reverse of both the comforter and shams is the same corresponding dark blue from the face. Three decorative pillows use pleating and embroidery details for added value to this collection. Purchased for a guest room in a coastal home and love it! Found a navy bedskirt at O and put together it is a wonderful look. The accent pillows make for a designer touch and am thoroughly pleased with this - wish I had purchased it for the master bedroom instead of the guest! Washed the quilt before use and it did not shrink. This is more a coverlet than a quilt, but it was perfect for my needs. Looks even nicer in person. Only thing is its very short. It needs to be 6 inches longer. I found this comforter originally at *** for over **. That's was a,little much for me so I thought I'd give OS a chance and see if they had the same ... set by 1/3 the cost. I was even more excited when it arrived. It matched perfectly, felt so soft and is so comfortable. I absolutely love this comforter set. Thanks!!!! Wow! What a great statement ! I'd been looking everywhere, (not just on Overstock), for a new comforter set for almost 2 years. I'm extremely picky not only about quality, but also about every piece of the set being exactly what I want. I'd seen this set on here and "watched" it for a while. Some of the other reviews made me hesitant to purchase it. I've never bought a comforter set online. I like to be able to feel the quality before I purchase it. But, after much thought, I decided to buy it. I'm so glad that I did! It's a very nice set, and it looks great in my beach-themed bedroom. I was impressed with the overall quality. Everything is well-stitched. The accent pillows don't look nor feel "cheap". The comforter is thicker than I'd anticipated, so it feels nice to the touch. It is warmer than I thought it'd be, too. Even though I'm a hot-natured sleeper, I don't find it to be too uncomfortable. I do kick it off sometimes, but that probably has more to do with it being summertime and our experiencing triple digit heat indexes. It ought to be real cozy in the winter! It is beautiful! I kept looking at it for three months while trying to decide what to do with our master bedroom. I have a huge underwater scene over our king sized bed with the same blues and tans in it. I matches perfectly and has really dressed our bedroom up nicely. Lots of compliments from guests. Fabric is good quality, no fading when washed, and fill stayed put. Pillows are nice and firm and pull the colors together. I loved this comforter set. It was a really good quality for the price. It is heavy enough to stay warm yet light enough not to get overheated. The only problem I had with the product was that I have a California King with a thick topper and it wasn't quite as wide as I would have preferred. However, I was so pleased with the quality that I kept it anyway. After this comforter set arrived it was evident that the color was not close to what was online. I was looking for a white or off-white color and this was definitely a "beige" color. The entire quilt was cheaply made and I returned it immediately. Very nice set. The background is more tan than ivory as shown in the picture but it works very well for me. Would like the quilt to be 110" wide but it still works fine on our king bed. I purchased the shower curtain to make matching valances and to cover a lamp shade for a very finished look at a very affordable price. The color of the comforter is darker than depicted in advertisement. It is more of a beige background rather than an ivory. It as well as the shower curtain is sort of blah. The fabric is nice and appears well made. I was sad to see this set went on sale again before I even received it. It went from 112 . (Which WAS on sale) to 89. The comforter set was exactly the print and color wanted. I waited a long time to order to order it, and it took a long time to get it. Was pleased with the overall appearance size. Adds a nice look to my nautical bedroom. Just the right touch. It is easy to decorate with and certainly provides that relaxing seaside atmosphere. Love this!!! I use this comforter set in the summer and since I live in Florida it's perfect for that coastal look! Five stars ! Beautiful comforter and bed set. Especially loved the throw pillows. The comforter is soft and warm and the pillow shams are soft. So happy with this set, I bought the matching valances.Im going to give it as a gift to help furnish my friends room, she saw the set and loved it so much she decided that her room needs a makeover, I only wish it had matching curtains, but any shade of shade will go with the set or gray so it will still look complete. Long lasting bedsheets. Good choice. This looked like a hotel spread and I was very disappointed. 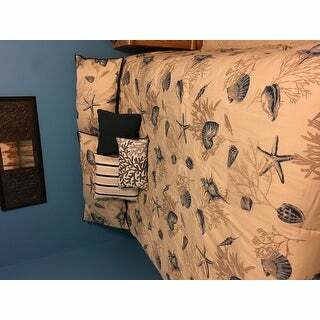 Love my comforter perfect for my seashore theme. Very comfortable and easy to keep clean. Enjoy using it for summer months. Like the color. I purchased this for my beach house and the only reason I switched to the Madison Park Coverlet set was because it fits better in my washing machine. "Are the shams available by themselves?" 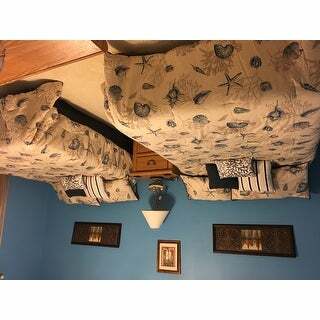 "I purchased the king size comforter set when we bought our beach condo. I love the colors and design but the only way to have the comforter cover the mattress completely is to turn it so the shells and coral are sideways. Has the comforter been redesigned so the shells are running top to bottom on the long side rather than top to bottom on the shorter side?" "I have a king bed, but the mattress is very high. Coverlets are too small. Will this king fit to the bedskirt?" I have a standard height king mattress. This comforter barely covers the top of the mattress unless I turn it sideways which looks ridiculous with the coral/shells going the wrong way. . I really believe the comforter is more queen size. 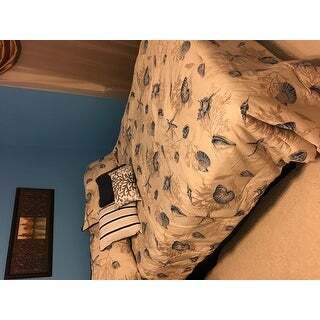 "I ordered this bedding and washed it in cold water like it said and the blue colors ran into the beige colors. And now there is blue sploches on it. Did this happen to anyone else that bought it? And if so, how did you remove the color stains?" I didn't have this problem but I always put a color catcher in the wash to prevent bleeding. You can try soaking in a vinegar water solution and use a shout color catcher. Good luck. "What bed skirt goes best with it? I, too, purchased the Nantucket coverlet set and love it....Want to add a bed skirt but want to pick the right shade of blue. Thanks"
I bought the coverlet set; no bed skirt. I've put the question in the wrong place! "What color is the bedskirt? In the picture it appears to be navy." Yes it is navy, sort of a washed navy color. Very nice! The bed skirt is very close to the same color blue as in the comforter. The bed skirt is navy. This set is super nice. "Is there a shower curtain in this design?" Yes, there is. The shower curtain is under item#15854514.